Nutrition Elevated – AND Polls Are Open! The polls are now open for AND elections. Voting is available online February 1 – 22, 2017. Let your voice be heard for our national leadership! Let’s make UTAH the highest voting state in the Academy. Help shape the future of the Academy by exercising your member privilege to vote. 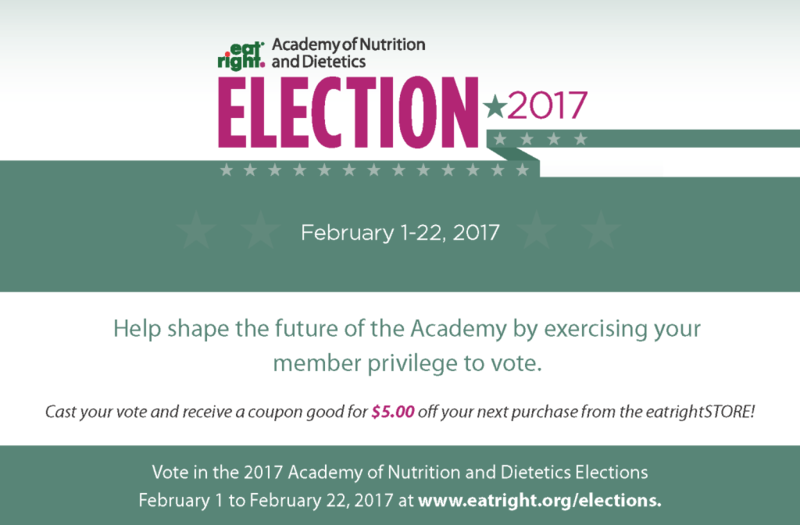 Learn about the candidates and vote in the 2017 Elections February 1 to February 22, 2017 at www.eatrightPRO.org/elections. Cast your vote and receive a coupon good for $5.00 off your next purchase from the eatright Store!